Nathan P. Gilmour , 17 May 2013. With that out of the way, the final grand scene in Purgatory is a particular kind of purgation, one that seems to be for Dante only. (There’s room for disagreement there–perhaps all the saved go through this last trial–but Statius, who is right there with the pilgrim as he undergoes the Beatrice-suffering, doesn’t seem to have his own analogous moment.) In addition to facing his betrayal of Beatrice, Dante must behold and bring back to the living a vision of the end times, both events that lead up to the final fall of the Roman hierarchy and the fallout of the same. Beatrice does not simply show up at the end of Purgatory. She makes an entrance. Before the chariot (normally YHWH’s vehicle of choice) reveals her to Dante, a visual argument ensues that will make the following vision, without a doubt, the stuff of divine oracle. The seven lamp-stands from Revelation lead the way, followed by the twenty-four elders form the same, then the four living creatures from Ezekiel. 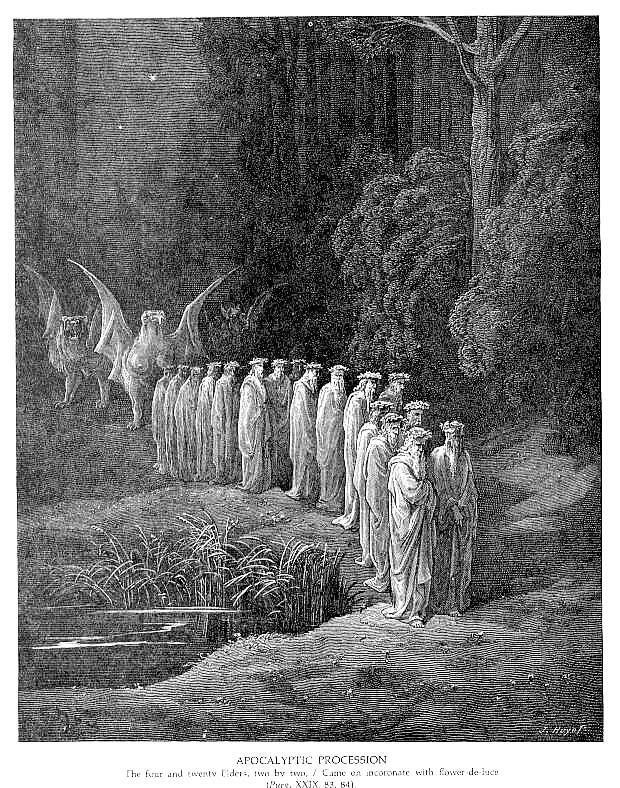 Dante even pauses to note that the one place where the vision differs from Ezekiel, it agrees with Revelation, namely in the matter of how many wings the creatures have. After them, Dante sees allegorical figures for the four cardinal virtues and three theological virtues, then figures corresponding to Paul and Luke and the other writers of the New Testament, with John of Patmos and seven other writers of the New Testament bringing up the rear. So to summarize, whatever comes next is going to have behind it the force of philosophy, Scripture, apocalyptic disclosure, faith, hope, and love. And with all that, in comes… Beatrice. When Beatrice arrives, no paraphrase can really capture the language that the pilgrim musters to describe her glory. Go read it. But the purpose behind the big reveal is not merely that of aesthetic devotion (thought there’s some of that too): Dante must face his shame. Having passed through the seven disordered loves that human beings have in common, Dante must face his own personal guilt (yes, Critical Theory people, I just used “guilt” and “shame” synonymously), that which has brought him so low. She calls him out in front of the whole New Testament for betraying the vision of divine love that he received earlier, pursuing lechery and vain glory (and vainglory) rather than pursuing with diligence the higher ways that he could have had, even as a mortal. For Beatrice this is not merely personal; it is a blasphemy against divine grace, and she will not let Dante cross the river Lethe until he has faced it one more time. Again, the final trial seems particular to Dante, but I’d be glad to read comments to the contrary. [Y] ou must know that the sense of this work is not simple, rather it may be called polysemantic, that is, of many senses; the first sense is that which comes from the letter, the second is that of that which is signified by the letter. And the first is called the literal, the second allegorical or moral or anagogical. Which method of treatment, that it may be clearer, can be considered through these words: `When Israel went out of Egypt, the house of Jacob from a barbarous people, Judea was made his sanctuary, Israel his dominion’ (Douay-Rheims, Ps. 113.1-2). If we look at it from the letter alone it means to us the exit of the Children of Israel from Egypt at the time of Moses; if from allegory, it means for us our redemption done by Christ; if from the moral sense, it means to us the conversion of the soul from the struggle and misery of sin to the status of grace; if from the anagogical, it means the leave taking of the blessed soul from the slavery of this corruption to the freedom of eternal glory. And though these mystical senses are called by various names, in general all can be called allegorical, because they are different from the literal or the historical. Now, allegory comes from Greek alleon, which is Latin means `other’ or `different’. This moment rewards the same kind of polysemantic reading: in terms of the literal narrative, on its own terms, Dante experiences psychological disorientation as he remembers intensely, then forgets. But morally, Dante might be pointing to the ethical experience that many seem to have upon conversion, a strong sense of personal guilt just before baptism (or whatever experience stands in for baptism in other kinds of conversion-rituals). And allegorically, Beatrice seems to be standing in both for law and gospel, convicting Dante and proclaiming his release. And anagocially (because why stop with three? ), Dante might be living through the same tribulation-before-the-consummation that the Biblical apocalypse narrates so memorably. Now if I had just made up those four interpretations, one could rightly accuse me of being an English major with too much time on my hands for interpretation, but given what Dante wrote about his own work, I don’t think I’m too far off here. What Dante sees next convinces me that the human being Dante Allegheri likely thought that the world would end during his own lifetime or shortly after. I don’t think that disqualifies him from being a great poet or philosopher, but it’s hard to deny that the expectation is there, especially when one reads the Purgatorio‘s apocalypse next to the passing mention of the Greyhound in the early Cantos of the Inferno. What brings about the end of things is the corruption of the Church, and what replaces the hierarchy that’s also become a military force is one Empire with two swords, the Church with its Bishop of Rome and the Crown with its Emperor of Rome. I used to be more critical of Dante’s imperialism, but as I’ve gotten older, I continue to disagree but don’t blame him nearly as much. Trying to put myself in his position, I have to realize that the Papal corruption for Dante was no mere historical curiosity but a rift in the very fabric of salvation. In Dante’s eyes, the world needs visible and clear moral authority, and when the Pope maintains a private army, acting like one more feuding prince (or, even worse, refuses to hold court in Rome, the seat of Peter), there’s an urgency to the situation that a Protestant like me can’t really imagine. Moreover, as someone who’s living the last years of his life in exile because of feuds between Guelph-Ghibbeline and even more finely divided factional struggles, Dante certainly knows firsthand what happens when the effects of unstable political forces can be. So in his vision, Dante imagines one Pope and one Emperor, spiritual and temporal power centralized but not combined, for the sake of peace in all the world. In that respect Dante’s apocalypse is not the end of temporal power, as the book of Revelation seems to make it, so much as an establishment, by divine decree, of the truest justice possible on earth. Thus is the vision that Dante brings back, and thus his expectations seem to stand. If you’re a CHP listener (and you should be if you’re not), you might know that David Grubbs claimed in a recent show that Martin Luther might end up agreeing with Dante more than I suspect. Writing up this post, I still can’t reconcile someone who would regard the good deeds done without knowledge of God as inherently sinful with someone who would use the same deeds to lead the desires of the saved towards God. Am I making too much of this? Does Dante’s apocalypse strike you as a defect in an otherwise great poem, one more sign that it’s overrated, or something that adds to the grandeur? Why? Why, do you think, does Dante have a super-Purgatorial trial of memory? Do the four levels of reading above make sense of or muddy further that episode?